Had to try something different with cauliflower apart from the standard curries.. 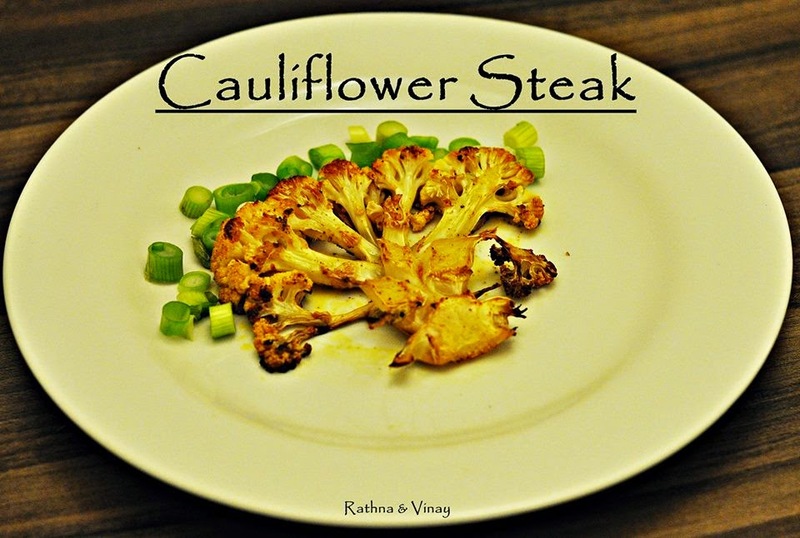 So, here's presenting.. Cauliflower Steaks! Take a whole flower i.e the entire cauliflower head with the stalk and then chop, season and bake in the oven. Heat the oven to full temperature (275 degree Celsius). Chop the head of the cauliflower to get a piece as shown in the picture into 1 inch thick slices. Chop the whole cauliflower into half and then chop the flower from centre outward. Mix all the other ingredients together and make a rub. Place the cut cauliflower heads onto a baking tray lined with baking paper. Ensure the cauliflower slices do not over lap each other. Generously apply the prepared rub mixture over one side of the cauliflower and then flip the cauliflower and apply it over the other side. Now bake the florets for approx 20 minutes, till the florets soften and start browning. Dish up the cauliflower steaks with a side salad. Cooking time may very depending on oven temperature so watch the cauliflower once its in the oven. You can also try this recipe with your own rub using some Italian spices like Oregano, parsley, thyme, rosemary and crushed garlic.